All in all a hectic week, even for one with a snow day smack in the middle. Work deadlines aside (constant drumbeat that they are), our domestic plant experienced a bit more chaos than usual, with major appliances deciding in concert to abandon their prime functions. But we’ve now beaten back the forces of entropy and now can wash clothes on the premises again. That being said, work does progress on the book collection. I now have about 27 plates (roughly 60 individual patterns) substantially drafted or in progress, along with a good start on the documentation that accompanies them. Also a start on the bibliography. My notes are far from exhausted, and there are lots more pages to go. I also continue to playtest some of them. Here’s one I couldn’t resist. 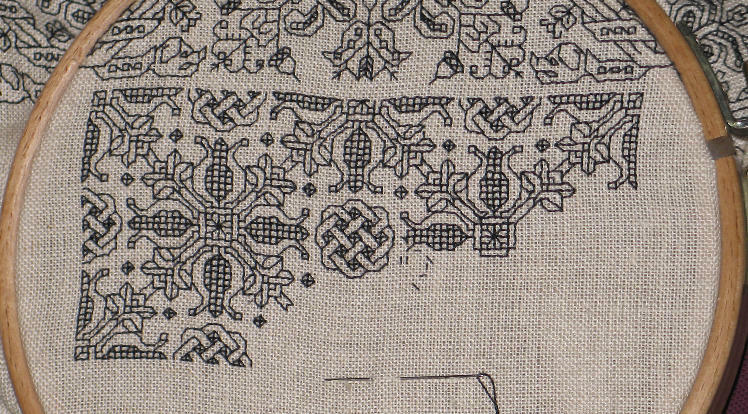 It’s from Plate 25 of my blackwork fillings collection. Work continues on that final PDF, too. Even though this design is original and not sourced to a specific historical artifact, I think it would make a smashing all-over design for a coif or sweet bag. Especially if the little diamonds that surround the quatrefoil pomegranates were replaced by spangles. You can see the full effect in this larger rendition. The pattern collection’s thumbnail made it hard to see the whole design’s geometry. Finally, in a new development, I’ve decided to give the blackwork fillings collection a name. I named my first book after the SCA group here in Boston, a group especially blessed with artists, artisans, researchers and folk who just plain enjoy hands-on exploration of the arts and sciences. The Barony of Carolingia is and ever will be my SCA “home.” But I did spend some time down in the Washington D.C. region, and promised my House Oldcastle friends down there that someday I’d write “Ensamplio Atlantaea” – a pattern collection named after Atlantia. the kingdom that includes the D.C. area. So the blackwork filling collection will come out under that name (provided it passes muster with my language maven pals). And in the interests of continuity, the new book will be entitled “A Second Carolingian Modelbook.” That should make it easier to find for folk who found the first one to be useful.